There are many Hilton Head restaurants to pick from that will satisfy your taste buds. Having tried many of them from the trendy spots to off the beaten path, I have included a list of our recommended favorites that have served up some great meals and good times for us. They offer a range of atmospheres from a romantic dinner to family dining. 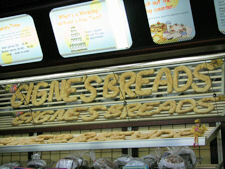 Signe's Heaven Bound Bakery is popular among the locals especially for the deep-dish French toast and whole wheat waffles. Hilton Head restaurants don't get any better when it comes to baked goods and mouth watering sandwiches for lunch. We have had both breakfast and lunch here many times, everything is very good! I like the Chicken Salad Tarragon sandwich and my husband enjoys the French toast (featured on the Food Channel with Rachael Ray) or a Hot Charlie sandwich for lunch. We both can't resist the key-lime bread pudding or scones. Mmmmm! Often times we have visited Signe's Bakery and there has been a long line but it moves fast. There usually is a wait at most Hilton Head restaurants, this one is worth it. Avoid going here if youre in a hurry. Don't sit in the dining room, go to the front and order then tell them where you're sitting, they will bring out your drinks and food. We always make a stop at the bakery when we're done eating and bring home some baked goods. They have many delicious types of bread, especially the Italian ciabatta. By the way, Signe's Bakery has been voted best bakery on Hilton Head Island by Southern Living. Our family tradition is to eat at Giuseppis Pizza the first night of our vacation. After a day of traveling we crave this delicious pizza and waste no time! Everyone else has the same idea and it's a crazy dash to get your name on the waiting list. 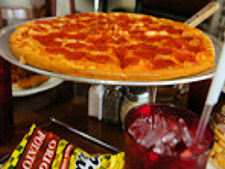 Most restaurants on Hilton Head Island require a wait, but none like Giuseppi's. Some nights they're too busy and only take a certain number of names for the list, so get there early if you can! My kids love pizza, so we do order take out one or two more times before ending our vacation. Keep in mind if you order take out, it still takes one to two hours depending how busy they are. The chicken wings are pretty good, same for the Spaghetti with meatballs or Lasagna. All their entrees are priced under $10 so its very reasonable for Hilton Head restaurants! Giuseppi's is the Home of the Weggie; it's a pizza and hoagie combined. If you like spicy, try the Buffalo Chicken Weggie. Avoid Guiseppi's on Tuesdays June-August, Harbourfest is right around the corner, it's a longer wait, everyone is trying to get pizza before going to Harbourfest. Most Hilton Head Island restaurants are real busy this night. There is a Piggly Wiggly at the other end of the plaza so you can grocery shop while you wait for your table or just window shop the other stores in the plaza. One of our favorite stores is Outside Hilton Head. Check out their hammocks! There are many Hilton Head restaurants to pick from, this one you won't want to miss! See you there! My husband and I stumbled upon Harbour Town Grill by accident and this has been one of our best finds in all our years going to Hilton Head Island. We thought this Hilton Head Island restaurant was for members only because it was in the clubhouse of the world-famous Harbour Town Golf Links, but it has since been opened to the public. We were expecting Harbour Town Grill to be a bit pricey and with average food; we were wrong! The food was very good and the price was average for Hilton Head restaurants. We had the salmon and filet which was very tasty. Their soups are just as pleasing, especially the Vidalia onion and potato. Also good tasting is the sautéed shrimp dish; the shrimp are fresh from the local shrimpers. The menu has a variety of dishes to choose from and you can keep it simple if you want with a big burger. The childrens menu is pretty basic with burgers and sandwiches. During the day the atmosphere is causal with deli style sandwiches, burgers and salads. Dinners are more formal and elaborate. Restaurants on Hilton Head Island usually have some sort of view; this one overlooks the famous 9th hole of Harbour Town Golf Links which has been the Home of the Heritage Classic PGA golf tournament since 1969 - now known as Verizon Heritage. My husband got a kick at all the photos and trophies in the foyer of all the golf legends that played there including Jack Nicklaus, Arnold Palmer and Greg Norman. 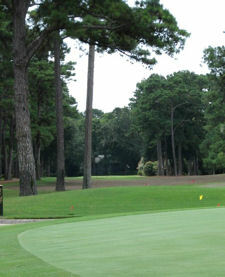 Theres a lot of history at Harbour Town Golf Links and is well worth a visit! What can I say? Youve got to go to The Salty Dog Cafe at least once! This used to be a place for the locals however The Salty Dog Cafe at South Beach Marina in Sea Pines has become one of the most popular restaurants on Hilton Head Island. Why? Im not sure; The Legend of The Salty Dog may have something to do with it because the food is nothing special especially after a 2 hour wait! At times I feel they have a long wait so you shop on the boardwalk. And actually it is a great place to buy souvenirs and visit the Salty Dog Shop where you can purchase the famous T-shirt. Long ago South Beach was a fishing village. Legend has it a local fisherman and his dog, Jake, were lost at sea after a rogue wave slammed their boat and they were thrown in the ocean. The man began to lose hope, but not Jake. He headed west swimming for 3 days and 3 nights with the man holding fast to his collar. No one knows how Jake could have known the way back to his home port. 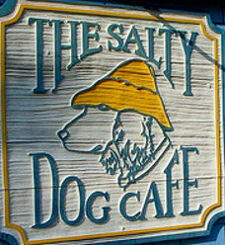 The townspeople built a gathering place in the village and named it The Salty Dog Cafe - in honor of Jake's heroic feat. Pictures of Jake wearing his yellow sou'wester hat adorn the walls. He definitely has a place in nautical history! You may be wondering why we recommend The Salty Dog Cafe, we're dog lovers and I guess by visiting the boardwalk and the restaurant we believe in the legend that a dog is a mans best friend and will do anything for you. Too, our kids love to look around the shops and watch the dolphin swim in the marsh that surrounds the boardwalk. If you prefer not to do the wait for The Salty Dog, then go around the corner to The Wreck, its owned by the same company, the food tastes the same with a much shorter wait and you can still spend time on the boardwalk. One of the finest restaurants on Hilton Head Island has got to be Red Fish. Awarded the Best of Award of Excellence by Wine Spectator from 2003-2008. Our orthodontist, another frequent visitor to Hilton Head, introduced us to Red Fish recently. Red Fish offers a cuisine where a distinctive blend of seasonings, vegetables and tropical fruits give each dish Island flair. The wine list is extensive; and if you desire you may choose your own wine from the wine shop on site. Different from many other Hilton Head restaurants, Red Fish features naked fish or in other words, not fried. They grill this popular island catch in olive oil, lime and garlic. Serving lunch and dinner Red Fish is the perfect place for lunch after a round of golf or a dinner date at the end of the day. Business casual attire is recommended as are reservations for dinner. Be sure to visit the retail wine shop at Red Fish, nearly every wall is overflowing with wine bottles. Peruse their collection which is arranged by region and variety. And unique to many Hilton Head Island restaurants you can select your own wine from Red Fishs selection and bring it back to your table for a small corkage fee. Dont let its commercial strip plaza location fool you! Inside youll dine amid candlelight, fine artwork, dark furniture, and white linens which make it one of the most popular Hilton Head restaurants. Enjoy! My husband and I enjoy CQs for a romantic night out. 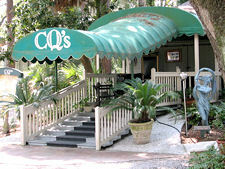 We've been to many Hilton Head restaurants but CQs has never disappointed us, in fact we have had some of our best meals here. CQ's is nestled among moss draped oak trees in Harbour Town, you feel like youre in an old cozy house with pine floors, wooden mantle pieces, stained glass and memorabilia of the Lowcountry culture. They too have one of the best wine selections for Hilton Head restaurants. The Lobster Pasta is fabulous, so are the Bison Ribeye and Ahi Tuna. We always have a hard time deciding because everything on the menu is so tempting. This is not a cheap evening; plan to spend about $200.00 for two. Reservations are also recommended. Since this restaurant is in Sea Pines, you do have to pay the $5.00 to get into the Plantation, save your receipt and show your servers they will reimburse your money. So if youre looking for a romantic dinner, and unique setting among restaurants on Hilton Head Island, give CQs a try, I know you will enjoy it! 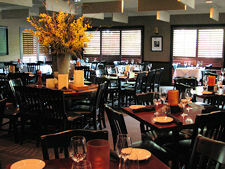 Make real time online dinner reservation for Hilton Head restaurants. Do you want the best and absolute freshest Seafood on Hilton Head Island? Are you willing to cook it yourself? Then give Barnacle Bills a try. His seafood is off-the-boat-fresh! Bill has been selling fresh seafood on Hilton Head Island for about 28 years in a small seafood shack. Barnacle Bills has a wide variety to choose from as well as his fresh catch of the day. Our kids were not wild about seafood, so we went to Barnacle Bills and got a sampling of Grouper, Swordfish, Sea Scallops, and Shrimp. We now have seafood lovers! Bill will provide cooking instructions and most of his seafood is locally caught. Nothing is imported, imitated, frozen or thawed. Barnacle Bills is located next to the Log Cabin Gas Station on the north side of Business 278, halfway between the 6th and 7th mile maker. Hilton Head restaurants are some of the most expensive in South Carolina. Moderately priced restaurants in Hilton Head are considered very expensive in other parts of the state; make sure you know what youre getting into! I highly recommend you call ahead to get your name on the waiting list or see how long the wait is if the restaurant does not accept call ahead. Most restaurants do take call ahead which is very nice especially if you have kids, they dont like waiting for anything! Go early if you can! I know its hard to drag yourself off the beach or golf course but even if you get to the restaurant by 5pm, you're still early and most likely will not have to wait. Make reservation where you can, I sometimes make them before we leave for vacation. My kids always ask, where are we going to eat tonight? I feel so much better when I can answer them. Most importantly, relax and enjoy the experience of dinning out on Hilton Head Island!